Reflective 1 Inch Adhesive Vinyl Hot Dots - 704 Dot Sampler Pack. NOTE: These are not glow in the dark dots, they are reflective dots. You are buying one 64 dot count sheet of all 11 colors for a total of 704 Dots - for a total of 11 sheets. This 704 dot sampler pack contains all eleven colors of our Vinyl Hot Dots. This is a huge value to customers who want to individually mark different paths, different objects, or to tag individual pieces of equipment. These "Hot Dots" are manufactured out of polymeric film with an adhesive backing and are flexible, tough, "UV stabilized", and highly weather resistant. Micro-prism elements reflect light and increase visibility. These are great conspicuity markers! See the "Enlarged for Detail" picture below which shows a very close view of the "prism elements" on the polymeric film. 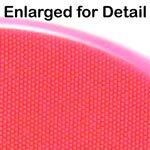 These reflective stick ons dots can be used for safety markings, to bring attention to building corners and mail boxes, and decorative purposes. These are extremely durable, can be written on with a permanent marker, are extremely hard to tear, and can withstand outdoor atmospheric abuse. Colored Dots are ideal for color coding and for enhancing or highlighting objects when in a low light condition. See the image on the Right of how our Hot Dots reflect with a handhel flashlight! Put Hot Dots on helmets, backpacks, school bags, safety belts, signs, anywhere you need visibility. Ideal for marking paths to bring attention to potential hazardous areas. Great for mail box and route ID. Use them to create lanes, aisles and escape routes. The list of uses goes on and on! A single sheet of 8 allows you to try out different colored dots for experimental use. A single sheet of 64 is most economical. Volume discounts start at 10 Sheets!